Put the potatoes into a saucepan full of cold, salted water, and bring them to the boil. Cook them for around 15 minutes or until just tender. Remove the potatoes and set them to one side. 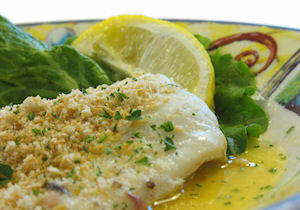 Cut the haddock fillets into large chunks and place them at the bottom of a baking dish. Finely slice the leeks by slicing them in half once, and then each half in half again, then hold the pieces together and dice them. Pour the fish stock over the haddock pieces and sprinkle the chopped leeks and peas over the fish. Season well with black pepper and chives. Finely slice the potatoes and place them in thin layers over the fish. Season them again with black pepper and sprinkle them with the cheese. Cook the dish for around thirty minutes at 200C, until golden brown and the cheese is melted. Very easy to make and full of nutrition for health freaks. I personally found it bland so next time will add a little cumin or even paprika to spice it up a little. Average rating of 3.00 stars based on 1 reviews. Summary: Haddock meets leeks, peas and a creamy sauce with crispy, cheesy topped potatoes. What more could you want for your dinner? This is a super easy dish that's perfect for a mid-week supper. Serve it with roasted new potatoes for an easy, elegant dinner.